Try using roasted zucchini and Japanese eggplant to replace the noodles in this vegetable-loaded and gluten-free recipe for vegetarian zucchini and eggplant lasagna. If you’re wondering what kinds of vegetables to put in a vegetable lasagna, I started by looking at vegetables with shapes that mimic the shape of lasagna noodles. Zucchini and Japanese eggplant were where I landed. When you thinly slice these veggies, they work the way noodles do in a traditional lasagna. Japanese eggplant (as opposed to regular eggplant) is the right choice here because they are more similarly shaped to zucchini, meaning they will fit well into the dish and cook in the same amount of time. When buying produce for this recipe, try to buy similar sized Japanese eggplants and zucchini to ensure they cook in the same time and you get the same amount of slices out of each vegetable. The sauce in this lasagna is a simple marinara sauce (I like make my 20-minute marinara sauce), then I dot the layers with ricotta cheese which replaces a bechamel in this recipe. Using ricotta in place of a bechamel takes out a lot of the work that makes cooking lasagna somewhat laborious. The final layer gets sprinkled with mozzarella cheese so you’ll still have that bubbly, melted cheese on top. This recipe requires a couple of steps, but it’s all worth it in the end, I promise. Why do you roast the zucchini and eggplant before making the lasagna? The first step is to roast the zucchini and eggplant before assembling the lasagna because this ensures the vegetables cook properly and don’t release too much liquid into the dish. Zucchini and eggplant are both very watery vegetables, so roasting them first will allow them to release some liquid while they cook. Roasting the vegetables ahead of time also allows them a chance to caramelize which deepens the flavours of the dish. It’s a win, win! Is it weird that I’m feeling completely inspired by February? Whatever it is, I’m happy about it. I’m back on the bandwagon of focusing on taking good care of myself in all aspects of my life. I found that in January I was spending too much energy focusing on the negatives and the things and situations that were completely out of my control. This definitely starts to wear on you after a while. There were a few major things that were causing me stress in January, but I’ve either A) had a bit of a breakthrough or B) decided to try my best to leave them behind in January. Something I’ve realized? Just keep going, and pushing forward and things have a way of working themselves out. This is hard to realize in the moment because those taxing times are riddled with doubts, insecurities and roadblocks, but there will be a glimmer of light at the end of the tunnel. I think it’s a mix of that hint of light at end of the tunnel and the simple day-to-day changes I’ve been making that are helping me feel inspired. 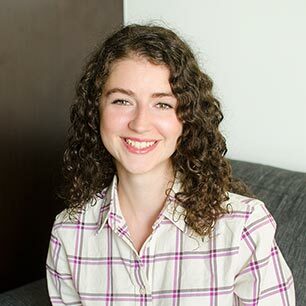 So, what are these simple, actionable changes that are making a difference for me? I’m drinking more water and green tea (so easy, but important), taking Sophie on more walks in the sunshine, making exercise a priority again, eating better (this vegetarian zucchini and eggplant lasagna is part of that) and reading more books that I love. Taking time to just be and feel. It’s amazing how much these simple changes have made a difference. It’s this principle that I used when creating this recipe for this vegetable-loaded comfort food. 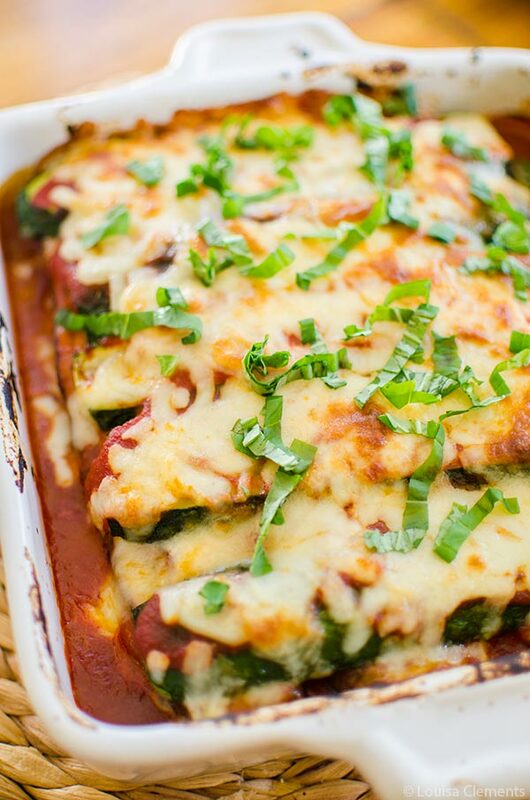 Try using zucchini and Japanese eggplant to replace the noodles in this healthy and gluten-free recipe for vegetarian zucchini and eggplant lasagna. Preheat oven to 425F. Toss zucchini and eggplant with olive oil, and salt. Arrange on two baking sheets, roast in the top and bottom thirds of the oven for 10 minutes switching sheets halfway through. Let cool until safe to handle. Spread 1/4 cup marinara sauce on the bottom of an 8x8" baking dish. Top with 4 slices of eggplant, followed by 1/4 cup of marinara sauce, dot with ricotta cheese, layer 4 zucchini slices crosswise on top of eggplant, top with 1/4 cup marinara sauce and dot with ricotta cheese. 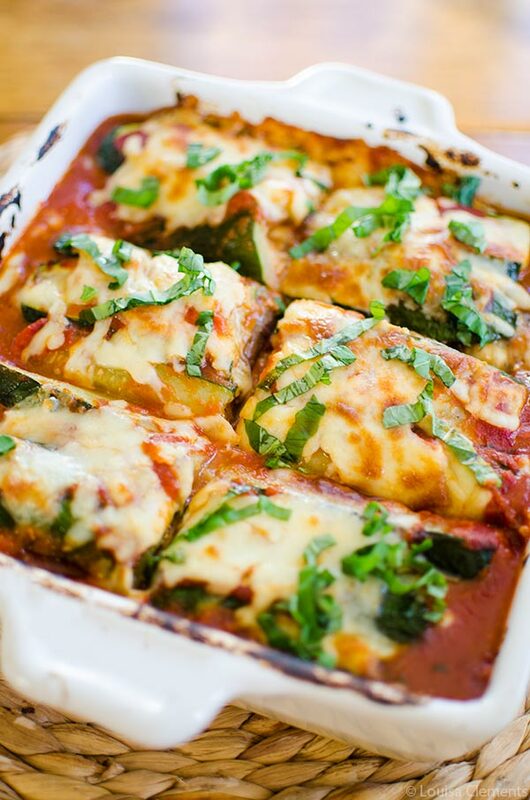 Repeat with remaining layers, finishing with zucchini, 1/4 cup marinara sauce and 1/3 cup grated mozzarella cheese. Roast in the oven for 20 minutes or until cheese is melted and bubbly. Allow to cool for 10 minutes, sprinkle with fresh basil and cut into 6 slices. Are there any simple changes you’ve been making this year that are working for you? 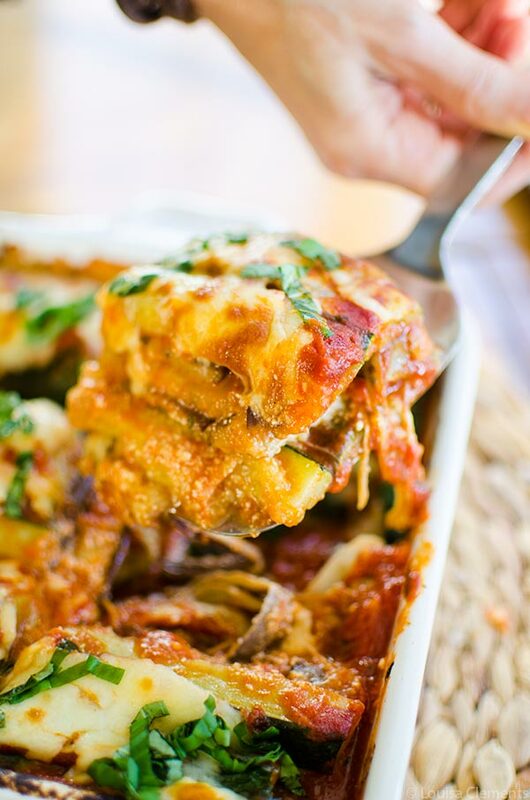 I’d love to hear your suggestions in the comments, also let me know if you give this zucchini and eggplant lasagna a try! Thank you! I love this recipe! I have made this multiple times , although I have used blended cottage cheese instead of the ricotta because that's what I have around . I make it on Sunday and eat it for lunch all week , my co-workers are always jealous. I also thought to make it for a dinner party because there were a few vegetarians - everyone loved it! Very interesting recipe to try! I never made vegetarian lasagna. Thank you for sharing! Thanks Gala, let me know how it goes! We use meat sauce but replace the pasta noodles with eggplant and zucchini instead, it's really good! That sounds great Nick, I'm glad you enjoyed! Thanks for letting me know. Do you think adding a bunch of other veggies would sog the lasagna out too much? I’d really like to add mushrooms and spinach and make it chock full of veggies. Hi Tyler, I've never tried it, but you could definitely add some more veggies between the layers. I would recommend using thawed, frozen spinach and really squeezing out as much of the liquid as possible before layering it between the zucchini and eggplant. In terms of mushrooms, you'll definitely need to cook them first so they can release their excess moisture. I'd go with either spinach or mushrooms in this case. Let me know how it goes!